Kazuhiro Fujitaki is a lecturer at the Tokyo Metropolitan Vocational Skills Development Center. He has written a number of books on electrical engineering and runs a website offering useful information about Japan's qualifying examinations for electrical technicians. Chapter 2: What are Electric Circuits? Chapter 3: How Does Electricity Work? Chapter 4: How Do You Create Electricity? Chapter 5: How Can You Conveniently Use Electricity? 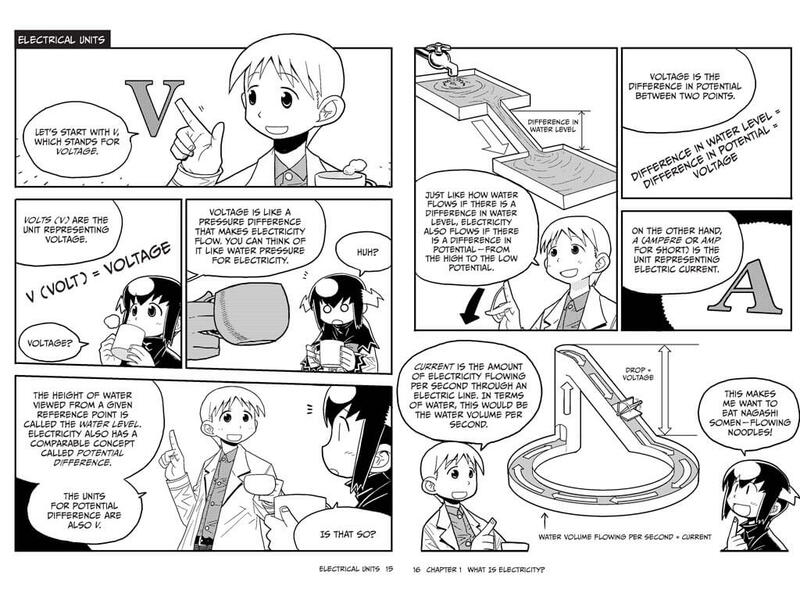 The Manga Guide to Electricity "is a lot of fun to read. The interactions between the characters are lighthearted, and the whole setting has a sort of quirkiness about it that makes you keep reading just for the joy of it." "The Manga Guide to Electricity makes accessible a very intimidating subject, letting the reader have fun while still delivering the goods." "It is a fairly comprehensive look at the subject of electricity, with most of the major topics covered. At the end of the book, the reader should have a fairly good grasp of the science of electricity and electromagnetism, so it certainly serves the job of a primer on the subject." "It was with The Manga Guide to Electricity where I finally discovered the power of this series." "Electricity is complicated. The Manga Guide to Electricity makes understanding it a little easier, or at least a little easier to swallow." "If you know anyone, especially someone who enjoys manga, whether a teenager or a kid at heart, or just someone who appreciates art with their text, who also is interested in a solid and interesting basic introduction to electricity, this book is well worth the read. I recommend it highly and am going to take a closer look at the entire series of manga guides that is still growing." "For parents trying to give their kids an edge or just for kids with a curiosity about their electronics, The Manga Guide to Electricity should definitely be on their bookshelves." "The author succeeds in presenting a clear, easy-to-understand guide to electricity. This valuable book serves as an excellent introduction to electricity, and would fit perfectly in any middle school science curriculum." The Manga Guide to Electricity "will ground you solidly in how electricity works, including it's creation, how it's influenced, and manipulated. Concepts of current, capacitance, potential, voltage, and so on, are all well taught, including the primary methods used to generate electricity in the world today. The result of this book may be enough to help the reader pass an exam similar to what Rereko faces, and possibly for a few, it might spawn enough curiosity to explore the topic further." "I really think this is a great way of teaching and is a wonderful aid for those taking classes on electricity. I know I learned quite a few things that I didn't know." The Manga Guide to Electricity "supplies a great mix between the storyline and the lessons in which Hikaru teaches the basics of electricity to Rereko." "There is a lot to like about The Manga Guide to Electricity. . . a must read." "If you're looking for an interesting way to learn about electricity, then The Manga Guide to Electricity is probably the book for you." "A great introduction for readers of any age, and an exemplar of technical communication." "This book makes things that put you asleep into a new and fun adventure." "An excellent introduction to electricity." The text should read "inversely proportional" and not "indirectly proportional". The right balloon of the bottom left frame should read: "When the temperature drops, the resistance also decreases." The diagram labels for wavelength have been reversed; the arrow on the left should read "long," and the one on the right "short."